It is worth to begin with the fact that the architect of this Trade Center was Norman Foster, who designed the unique by construction buildings in London, Paris, Singapore and others. 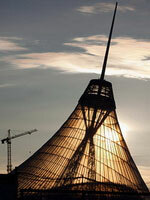 Besides, it is not the first work of Foster in Astana: the symbol of the country Baiterek, pyramidal Palace of Peace and Reconciliation. By the way, on a map of the city these constructions are placed on one line, and the Presidential Palace is included as fourth one here. "Khan Shatyry” in this line is the westernmost object. By design, it is the giant tent, and is considered one of the highest buildings of tent type in the world - the height of 102 meters, and with the spire - exactly 150 meters. The grid construction of the tent is held on the tripod weighing over 2000 tons, and its cover is made of special transparent material. Thanks to this cover and a special air-conditioning system the comfort climate is always maintained in a shopping center "Khan Shatyry”, independent of outside weather conditions. Floor area of the complex is 109 thousand square meters, which is approximately equal to 10 football stadiums. According to the project few grocery supermarkets, specialty shops, plenty of cafes and restaurants, as well as a water park and swimming pool with artificial waves will be placed here. In addition, it is planned to create several green areas in "Khan Shatyry”, which will present plants from different parts of the world, like the botanical garden. Construction of this phenomenal building lasted four years and the official opening was on July 2010. The president of the country Nursultan Nazarbayev, as well as the presidents of Russia, Turkey, Ukraine and Armenia attended at the presentation of new miracle of the Kazakh capital. Opening of the shopping center "Khan Shatyry” was the real festival for visitors and residents of Astana.